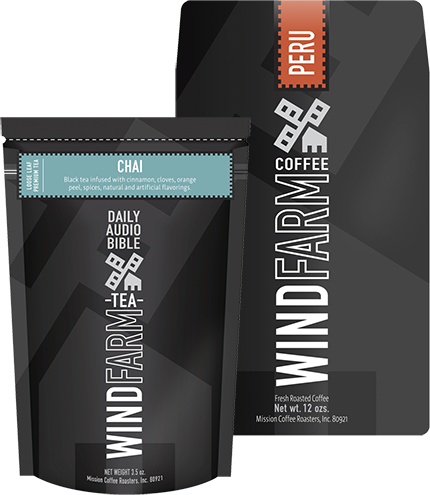 Windfarm Coffee Club is a monthly subscription service that delivers premium coffee straight to you. Each cup of our meticulously roasted craft blends goes to supporting Daily Audio Bible and Global Bible Read. Every month we select one of our premium regional blends to share with our club members so you can enjoy a variety of our artisanal quality coffee. Shipped at the first of every month, the coffee comes to you freshly roasted and ready to be enjoyed. Every cup of delicious coffee supports Daily Audio Bible and our mission to reach the nations with the Bible. "Ah...you have so spoiled us with this rich, dark brew that, try as we might, we cannot order any other." Choose your preferred type of coffee and how much you'd like to recieve each month. Subscriptions are billed each month so you are free to leave or join anytime. We ship our coffee freshly roasted at the beginning of each month. Enjoy a delicious cup of our artisanal coffee while listening to Daily Audio Bible. How many bags of coffee or tea would you like to receive each month? Purchase bulk orders of coffee at a discount for fundraising purposes. Purchase our premium coffee and tea blends individually.